Hamilton continues to evolve and slowly come back to life. 2010 was another interesting year with several ups and downs. Let's forget about the downs for now - they already receive plenty of press. Here I present my ten favourite moments in Hamilton in 2010, in no particular order. Witton Lofts, 50 Murray St. W.
Film Work Lofts, 80 King William St. The Essex, 366 Bay St. N.
The Edison, 16 Strathcona Ave. S.
I've separated this project at 200 Stinson St. from the others due to the much-needed attempt by developer Harry Stinson to create an urban village at the site. Old homes across the street will house lofts and hopefully a ground floor cafe. Many other cities have neat little villages tucked into various neighbourhoods. I've always loved the Beaumont Village in Portland, one of many urban neighbourhoods with coffee roasters and small shops, and the little cafes set up throughout residential neighbourhoods in Ithaca, NY. I hope Stinson succeeds in bringing a nice neighbourhood node to Hamilton. With the York Blvd streetscaping complete, Central Library already re-opened, the Farmers' Market vendors moving back after this Saturday, we can finally start to fully enjoy a revitalized downtown street. A modest few blocks of York Blvd and Park St were converted to two-way traffic and streetscaped, but it will make a world of difference in creating a new environment for people and future shoppers of the Farmers' Market when it re-opens. Slowly, we're allowing life to spring up in downtown Hamilton instead of just treating it as a shortcut to somewhere else. Expensive and contentious, I know, but this is the only building of its kind in Canada. It was worth saving in my opinion and turned out quite nice as our seat of government. Another expensive project, but again, I'm glad to see this building is being saved. It was rescued at the 11th hour and will be a great symbol of the new Hamilton upon completion. This project has turned out wonderfully. A very modern, comfortable place to connect with the HSR - and it now allows us to proceed with the pedestrianization of Gore Park, which is much needed. Ahh, the stadium, perhaps the most talked-about story of 2010. My kudos go to former Mayor Fred Eisenberger and his strong stance defending our city. Hamilton has been pushed around for too long and shot itself in the foot too often. It was a breath of fresh air to see a mayor stand up for us, the people of Hamilton. This great neighbourhood retail district continues to impress with new venues such as the Earth to Table Bread Bar, Sweetness Bakery and Cheese Shop on Locke. This great area continues to improve. Perhaps a tad selfish as I live in Strathcona, but 2010 finally saw a couple of new dining options open within the neighbourhood. For years the residents have longed for more local development, including local options to grab a bite or a coffee without always having to trek over to Locke South or Downtown. Stonewalls Restaurant and Rolly Rockets BBQ have been great additions to the neighbourhood and offer a wide range of special events, live jazz, community meetings and most of all, great food. Congrats to both businesses. We hope to see you prosper for many years. Happy New Year, Hamilton! Here's to an even better 2011! It's refreshing to reflect on the positives of 2010. Thanks for the retrospective, Jason! The success of the highly attended Sept 25th Supercrawl is also memorable and hopefully precedent setting. Bang on, Andrea! Supercrawl, I thought, really showed what this city can be...and, it showed that it's right on the cusp. That night was probably my most enjoyable night in Hamilton. Incredible Ticat game, followed by Supercrawl, followed by a walk over to a packed Hess Village. You'd be hard pressed to find a downtown in North America more active than that Saturday night. Edit -- forgot to extend my kudos to the writer! Great piece -- uplifting in rather turbulent times. Bottom line. We have WAY MORE to be happy about and impressed with and hopeful for the future about our city than not. We do not have to hang our collective identity and hat on a money losing professional sports team no matter how attached we are to it. It is simply folly to do so. Thanks for the reminder Jason. @ slodrive wrote: "..uplifting in rather turbulent times." I really agree, this is a great piece-- not just to reflect 2010, but to reflect Hamilton's progress, by latest results not failings. This story goes into Google News (RTH is classed as a News site), but to heighten how it lingers online in search results through 2011 (or any story here relevant to you that should be read by more), I remind to link to the item from your own blogs... Well, duh, sure-- But it actually doesn't take very many around here, if those sites are themselves regularly updated and Hamilton relevant. Thanks... I'd rather people read this over what others have "printed online" for the past year. It was really refreshing to use this article as a symbolic napkin to wipe the bitter, rabid froth of the Hamilton Stadium Wars from my mouth. I found RTH through the Stadium battles and I have been deep into it which has caused a souring of my outlook on Hamilton and how it works. I am now reminded that much has transpired over the last year, and all that has has required several years of careful thought and planning. There is vision, there is forward momentum, there is growth in this unique city of ours. Thank you Jason for the love and caring of Hamilton shown in this article. I know I needed it, I'm pretty sure others did to. Agreed with mrjanitor, and it is nice to see the extent to which we can manitain our planning and political autonomy while pursuing development that benefits all in the city, rather than pandering to a private interest that wants us to build a stadium for them at their location of choice and yet insist that we the tax payers assume most of the risk. Moreover, in a city that needs to re-brand itself, it is development like this that can allow Hamilton and its people to shake off the notion that we are nothing more that a city branded by the Canadian Football League and one of its member clubs or steel production alone - thus our brand can start being about our skilled workforce, leadership potential, entreprenurialship, planning vision, and educational/experiential credentials rather than a brand centred around a pro football team. don't be too modest regarding strathcona, lots of excitement around there. Along King West, two shawarma shops have opened, Flat Spot moved into its new store nextdoor opening up space for the trendy new clothing shop # beside it. King West is becoming quite a draw thanks to longtime residents like Metro, Papagayo & La Luna. There's also the construction going on at good sheppard square with new public parkette, Vrancor finally finished their office beside that. Victoria Park looks wonderful. It feels like Trinity Bellwoods with the little shops and cute houses that surround it. I hope that old firehall is turned into a cafe. I think Stinson's Hamilton Grand project was a good news story, I hope construction starts soon. I just hope he can extend his underground parking under Bowen St or somewhere beyond the property square or it will be a tight fit to park methinks. Ahhh, if it were only so simple!! Trust me, I'm a Leaf fan (well, even more than that, a Hamilton Tigers NHL fan-in-waiting) and a Ticat fan --- if only I could disassociate myself from these teams!!! But nope...can't do it. My Leaf fandom has definitely taken a backseat -- but my Tabbies, not so easy...So, I continue to cross my fingers. I followed a similar path as you. I definitely echo your sentiments. Excellent article Jason! It's great to look back and be reminded of the positive changes that have taken place in our city, many of which will most likely lend themselves to further growth and advancement. Thanks for putting your passion for Hamilton on paper for all to read. Ha! Thanks sis. Yea, our family rocks. My writing? Not so much - you should see the version I sent to Ryan compared with this finished product. He's not editor-in-chief for nothing! Trust me I bleed black and gold. But if you take the emotion out of it..... it makes absolutely no sense to satisfy the whims of Mr Young. Purely on the basis of good business. We haven't seen the books, haven't seen a business plan that either discounts WH or supports any of his other choices, or satisfies the most basic tenets of best practices. What we have been, is feted with grandiose plans that are short on details and play to this communities emotional attachment to a local institution and fears that they may leave. My answer to that is and always has been.... Where are they going to go? Nowhere. And in the likely hood that some municipality somewhere is stupid enough to buy into this field of schemes then god help them. It in my opinion would border on criminal for our city council to pander to this private business and squander 60 million dollars of our money without setting the preconditions for that expenditure in no uncertain terms. As a lifelong Tiger-Cat fan, I'll never forget the excitement when WH was officially chosen as the site for the new stadium. I'm still somewhat hopeful. I honestly don't think my wife and I would have moved to Hamilton from Toronto without an area like Locke Street. We were spoiled living in Bloor West Village where we could grab some steaks from a butcher, fresh vegetables at a few different grocers, go out for dinner at a few nice places and actually go shopping for clothes in our neighbourhood. Locke Street really gives off that same vibe at half the price. I really hope more areas like our new neighbourhood grow more in Hamilton. Good article and good site. We found it when we were thinking of moving and its a nightly stop now. Thank you for your hard work and everyone for the comments that keep it interesting. Good article Jason, thanks. Yes Terry, maybe when I retire I'll move from the old east mountain to Locke St. Right now I can walk to work in 22 minutes from where I live so I like this, not having to rely on a car. But no question that whole area around Locke may be worth pursuing in a few years. Your writings continue to provide a breath of fresh air. Thanks. Although it's till just a paper transaction, I'd like to add Jeff Feswick's purchase of Treble Hall and the attached building that houses the Pagoda to the list. His business is heritage restoration, so I believe we will have a fully restored heritage structure of which we can all be proud within the next couple of years. Although I don't know Jeff, he is proof that we do have visionary private investors in this city, not just under-financed speculators who can afford to buy but who cannot afford to develop. Yes Graham, that is great news. That building will certainly land on a future top 10 list. As I said above, I could have done 2 lists. I mean, I left off the James North changes with Hotel Hamilton, Mulberry St Coffee, The Brain, Supercrawl, Open Streets etc..... along with projects like Treble Hall, Molinaro Group's first venture into downtown condo construction, The Hamilton Grand, MIP growth, beautiful new wing at Mohawk, The '8' project announcement etc...... More has happened in this city in one year than you realize when you sit down and attempt to narrow it down to a list of 10. I would like to add Ottawa St. North to this list. It has really changed since we moved here. I did some of my Christmas shopping at AllSorts Gallery, where I was able to find out, from the artist herself, how the glass jewelry I bought was made. I just took a look at the Ottawa Street BIA website and discovered that the street had been featured on Cityline, on City TV. The segment about decorating on a student budget (they used a Mac student's off-campus room) is here, and Ottawa St. makes its appearance about halfway through the episode. A new shop just opened up on Ottawa Street called The Button Pushers...they sell free-trade coffee, vintage clothing, art, buttons, etc...I love it there! Wow...looks very cool. If Ottawa can land a late night coffee house with art/jazz etc.... the street will start to attract a new crowd and become a bigger destination. I can't help but feel that it's going to happen sometime in the next couple of years. I've always wondered if the demographic is there for the late night coffee house, but we'll never know till someone tries. Mulberry seems to be doing good on James N.
A late night coffee house would be a complement to Limoncello, much like Mulberry is with Acclamation. I feel like that might happen if we had a movie theatre in the area. There used to be one, when we first came, near the old Centre Mall. Downtown has the Jackson Square Cinemas. I don't understand why the powers that be figured that, at the Centre on Barton, we've got the demographic for a Staples, a gigantic Canadian Tire, a Staples, an LCBO Superstore with a Vintages section, but no movie theatre. We're stuck with the Centre on Barton, we should at least try and make the best of it. Grew up in Hamilton but I've lived in GASP Bronte for the last 10 years. Anyway got on the site looking stadium info but found some really great stuff like Mr Leach's article. Anyway I took the day and checked out some of the new and improved 2011 Hamilton and I must say i was impressed. The Central library lobby looked awesome (and was packed with people). They also have a glass wall so you can see into the Farmer's Market. The Birk's Clock looks Huge! That clock is going to become again a landmark in this city. Saw the city hall reno which look the same on the outside but cleaner. City hall was closed so I missed much of the inside. Saw the Lister renos and you can start to see the difference. They did a similar building in Buffalo which First Niagara eventually went it- if it looks anytihng as good as that it will be worth it. 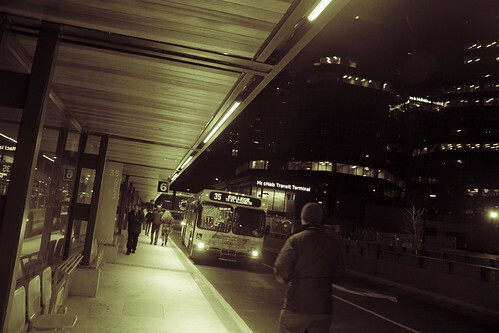 The new transit terminal looks good- very chic, very modern plus the novel concept of going to one place to catch a bus! Locke street was fabulous! Must go back when i have much more time! as for the stadium rally- it was that rally which told me this city was forever going to be different. it reminded of "How the Grinch stole Christmas". The Grinch steals Christmas but everybody still comes out and has fun. With all the shananagins that went on, I really thought only a couple of people would show up- Was I EVER wrong. It only made eveybody fight harder! "I would like to add Ottawa St. North to this list. It has really changed since we moved here. I did some of my Christmas shopping at AllSorts Gallery, where I was able to find out, from the artist herself, how the glass jewelry I bought was made." My wife who is a transplant from Detroit went shopping with a friend on Ottawa street in the fall and seemed to enjoy it- even pivked up this years christmas card there! Funny part is my Mom- Stoney creek mountain resident since the 70's gave here this perplexed look and said "why would you shop on Ottawa Street?". Obviously my wife didn't mind. Great review of the year in Hamilton. I was kind of stressed about shopping for Christmas presents this year, since everyone seems to buy everything they need, and even friends with kids seem overstocked with everything. I decided to try to get all unique gifts in the old lower city ie, in and around James St., as well as Locke St. and Ottawa St. It was fun and felt good not going into the malls. I feel like a bit of a douchebag saying that, but I guess I'm a douchebag. I know that word has been overused lately, but it's still fun to say. Ha! I grew up in Bronte, and lived in Hamilton for the past ten years. Bronte looks very different now. It was much rougher when I was a child. When I was growing up we had this awesome old theatre, 'the Broadway Cinema' that catered to the 'artsy' crowd. Good times. Seeing as everything old is new again, I hope we one day get an alternative theatre back in Hamilton.